Networking events in NYC are a great place for any business owner to pick up additional customers. If your business is not currently using networking as a tool to build relationships and gather leads, it might be a good time to start now. After all, it is never too late to start something new as long as it does not take away from your existing business operations or revenues. For businesses in New York City, there are a number of events that allow small businesses to interact with larger organizations, establish relationships and win new sales. 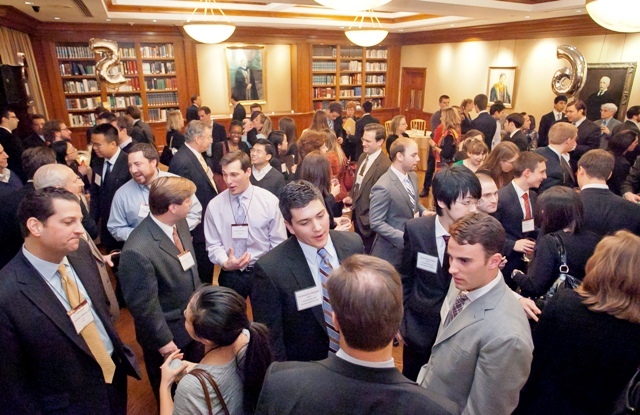 At these NYC networking events, all types of business professionals show up, including accountants, lawyers, IT professionals, corporate event planners and consultants. Additionally, you can meet executives, procurement officers, start up founders and more. These networkers come from organizations large and small. Some individuals might be a one-man start up while others represent the New York City hospitals and departments. Clearly, there’s an opportunity for anyone to win some business. Sounds great, right? Who doesn’t want the opportunity to meet with decision-makers and find more customers? Well, it is not as easy as just showing up. This business challenge requires you to actually have to network and have something to offer in return for other people’s time. Remember, most networking individuals might be trying to sell something too. To increase your sales at networking events, you will have to develop a strategy that works for you. Depending on your product or service, you may want to introduce yourself to as many people as possible or just a few select individuals who may be potential customers. Sometimes, this can work at career fairs too. This may require some trial and error. No one is a pro on the first shot. In a city like New York, you will have to have a strong idea of who is your ideal customer is, but also be creative enough to perhaps service some new customers. For example, hearing aid business owners may source new customers by talking to middle aged professionals whose parents need that particular medical device. The good part is that you will have multiple tries to get things right while doing customer research because there are so many events available all over the city. Especially in the tech hub of Manhattan, Silicon Alley, there is a lot of opportunities for networking. Keep in mind, NYC is the concrete jungle. You are not going to win any new business by sitting on the side and hoping that someone walks up to you. It is up to you to do the talking and network to the best of your abilities. As you attend more events, eventually learn what works best for you, helping win customers, run your business and start the conversation about what your company brings to the table. If you are looking for events in New York, it may not be quite so easy to find ones that are worthwhile. This is especially true if New York travel is new to you. Well, thanks to the internet, you no longer have to worry that you will not be able to find networking events in New York this weekend or any weekend in the future. There are plenty of sites that you can visit to find out what networking events are happening on any particular date. If you want to keep up to date on events in NYC, the following websites can help you out. The New York Public Library is an unexpected place to find out about business events in NYC. Probably because they do not have the best advertising. However, they have a ton of resources to help you find NYC business events and trainings all across the five boroughs. In fact, the NYPL Science Industry and Business Library offers their own events and business seminars for NYC professionals. Navigate to their Small Business Events and Training Calendar NYC page to find out more. You will be shocked at how many incredible events you find. MeetUp is an excellent website to find like-minded, career-oriented people. Thanks to the networking event site’s search feature, you can use it to find professionals in your industry or to find events for other industries that you may want to reach out to. With MeetUp, the possibilities are endless. Then, once you attend an event, you may be able to find mass text services about events in NYC. This is huge advantage for staying up to date on all the latest happenings in NYC business events. You have probably heard of EventBrite before when searching for something interesting to do on a weekend. But, what you probably did not know was that you can use this site to find networking events in New York and elsewhere, as well. EventBrite has the added benefit of being a one-stop shop for business listings. After finding an event you would like to attend, you can buy tickets through the site if necessary. EventBrite is the perfect spot to find NYC events for networking or enjoyment. The final website you can use to find New York events is designed specifically with women in management and working roles. In today’s job market and workplace, sometimes it is not easy to be a women. Sites like Women For Hire are the perfect solution. If you want to find things to do in Manhattan pertaining to your career or industry that focus specifically on the needs and strengths of women, Women For Hire is the website to visit.